Flat Socket Cap Screws are similar in design to button socket cap screws but with an 82 degree countersunk head. 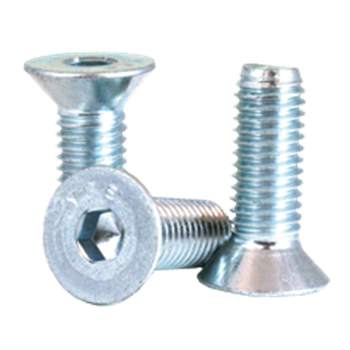 They are commonly used when a flush mounting, high strength screw is required. Tools and dies use alot of flat socket cap screws where moving parts pass over the fastened area. RC Fasteners & Components stocks flat socket cap screws in our online store in imperial and metric sizes, alloy black oxide, stainless steel, mechanical zinc, RoHS compliant zinc, nylon patch or nylon pellet, as well as tamperproof or tamper resistant styles.